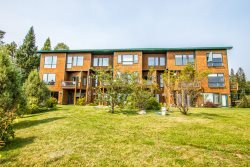 Enjoy a week or a weekend at this spacious end unit rental with panoramic views of the Big Lake. Overlooking beautiful Lake Superior near Tofte, MN. Aspenwood 6536 is a modern 4 bedroom, 4 bathroom townhome on Lake Superior. The home features a large main level living area with a full sized kitchen, living room, and dining room. Enjoy the large stone surround gas fireplace. The living room has a flat screen TV, satellite, DVD player, VCR, and amazing Lake Superior views. The large kitchen has granite countertops and comes fully equipped. Additional seating in the counter. There`s space for everyone. The dining room table can seat 6 guests. The first bedroom is located in the main level. It features a Full Sized Bed. The large master bedroom has a king bed and attached bathroom. The large windows in the master bedroom overlook Lake Superior- take in a sunrise over Lake Superior from the comfort of your own bed. The large master bedroom is a great place to relax and rest after a long day exploring the North Shore. Enjoy the attached bathroom and large walk-in closet in the master bedroom. Bathroom also features a Whirlpool Bath to relax after a long day. The second guest bedroom is located in the upper level and features a nice queen bed. Bathroom located in the second guest bedroom features a nice Shower/Tub Combo. The lower level family room has a flat screen TV and DVD player. Note: pictured fireplace is not functional. Enjoy a board game or just some quality family time in the lower level family room. The lower level bedroom has two twin beds. The lower level bathroom has a shower/tub combo. The laundry room on the main floor is available for guests to use during your stay. The cobblestone beach is accessible by a steep staircase. Wonderful views of Lake Superior. Enjoy 600 feet of private cobblestone beach shared with other Aspenwood townhomes only. Lake Superior and the North Shore are unsurpassed in their beauty. Aspenwood 6536 embraces this spectacular setting and takes it to the next level. This spacious four bedroom, four bathroom end unit comfortably sleeps eight people. Featuring a master king bed, one queen bed, one full bed and a set of twins there is room for everyone to feel at home. The townhome is a three-level unit with two decks that ranks among the most spectacular on the North Shore. Skiers and snowshoers are welcome, as are anglers, golfers, hikers, families, groups of friends and anyone looking to enjoy life on the North Shore. A full kitchen and dining room, plus additional rooms for relaxing means space will never be an issue. To ensure comfort, the gas fireplace in the living room and in-floor heat on each level create a warm and cozy setting with the ability to adjust based on each person’s needs. The one car garage is available to store your gear, providing extra space for living the good life inside the home. Speaking of the good life, Aspenwood is centrally located to the communities of Lutsen and Grand Marais. It’s just a short drive to some of the best hiking, golfing, biking, skiing and fishing in all of Minnesota. Many of the region’s best restaurants are a short drive away, as are an abundance of unique and locally-owned stores for outstanding shopping that the whole family can enjoy. From outdoor gear shops to boutiques, this townhome puts you close to everything the North Shore has to offer. Aspenwood also offers easy access to the Gitchi-Gami Trail. If you need more space, check out all of our Aspenwood Townhome options. We have 1, 2, 3, and 4-bedroom options available. Rent multiple units for larger parties. Allergy Warning: Guests with pet allergies should be aware that while this property is NOT a pet-friendly rental, the owner has cats and there may be some hair/dander present. We've stayed at many Cascade Vacation rentals and liked this one very much. It had just about everything we needed, the view was great.... a couple of the beds could have been a little more comfortable but overall, it was a very good experience. Great location and great value. Kitchen utensils were kinda odd but otherwise this was great! The home we stayed in was beautiful. The location was great and just a few miles from Lutsen Mountain. It is right on Lake Superior with stairs to the beach. Reserving the unit was easy, and the rental staff was wonderful. After making the reservation, I called the staff regarding a slight change and it was handled quickly and easily. Check-in and check-out were a breeze. We loved the location and views at Aspenwood. It was a wonderful place for a family with lots of space and multiple levels for the kids to spread out and play. The sunrises and sunsets were amazing to watch from the living room. We had a wonderful stay! The home was fantastic. It had all of the amenities that we could imagine (and more) and the location was perfect (it was quiet and not far from Lutsen Mountain). There was absolutely nothing that we did not like. The view was stunning. My favorite part was getting up early and watching the sunrise over the lake. The online reservation process was very easy and when I called to ask a few questions before arriving, the person that assisted me was very friendly and helpful. Accommodations were more than expected. What was nice is that all us had our own bedrooms and bath and we weren't on top of each other. The home was stocked with the necessities. We didn't need anything but our food. There was nothing that we would suggest you to change. Loved the location and view. This is our second year staying at Aspenwood, the location is excellent for hiking, there are several options nearby - Lutsen, Oberg and the Temperance River. Cascade is great to work with and we will be booking the same unit next year. The spacious townhome gives a group of ladies some space out group enjoys having individual bathrooms and bedrooms.